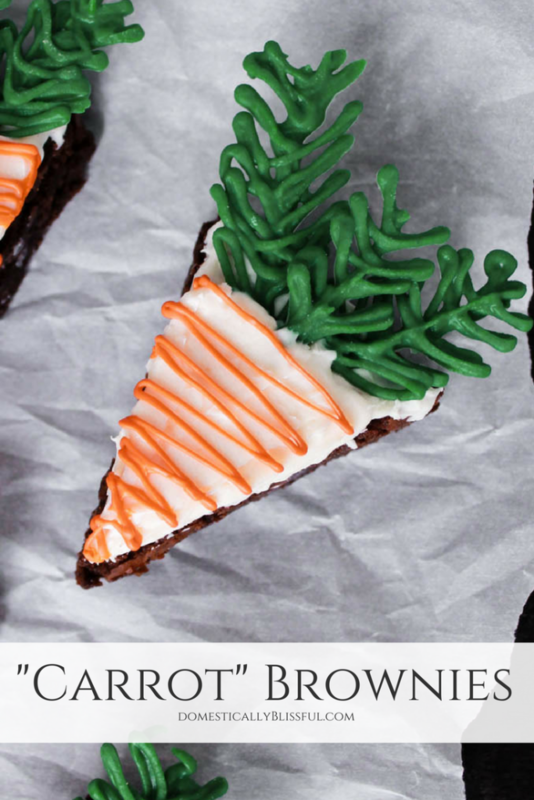 These “Carrot” Brownies are a semi-homemade dessert that looks adorable & is really easy to create! A few weekends ago we had some of my husband’s family over for lunch. As soon as my oldest niece arrived I excitedly told her that we were having carrots for dessert. She shot me her signature furrowed brow look, which can only be described as the most adorable confused, disbelief, & upset look that belongs solely to little Ellie. 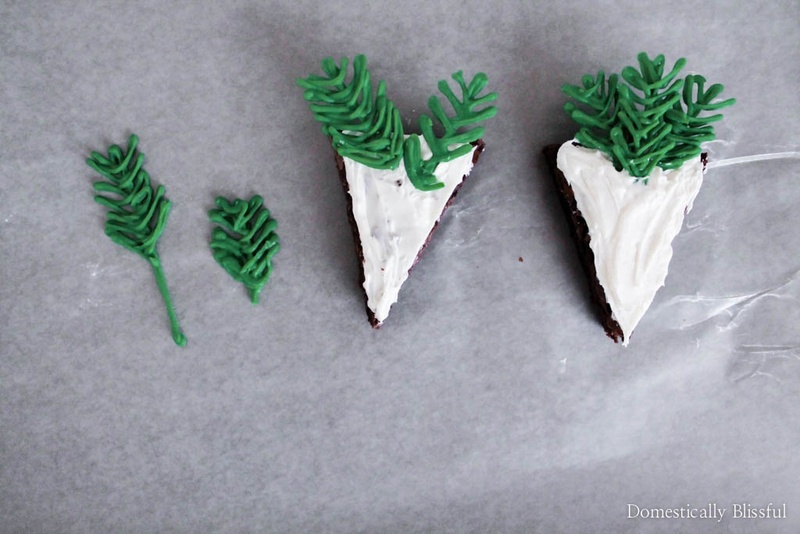 She then glanced around the kitchen & quickly spotted the carrot shaped brownies sitting in the center of the island. Ellie burst out laughing & then immediately began discussing the carrot brownies with my mother-in-law. I knew I would get the best reaction out of her & I am so glad I decided to make them the day before they came over so that they could enjoy them with us. 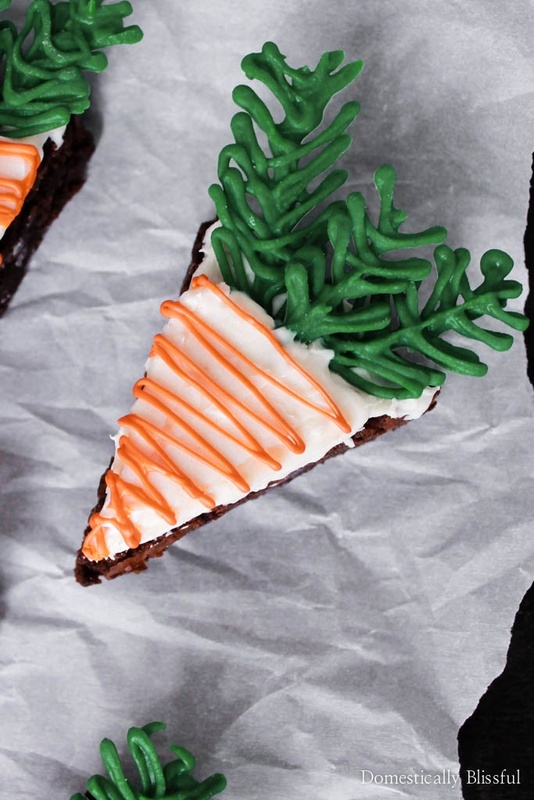 These “Carrot” Brownies are ridiculously easy to make, but the stems can easily break. 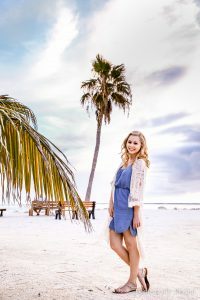 So I thought I would share a few tips with you to help you get the best results. My original plan was to make the leafy carrot stems out of candy melts, but I didn’t have any on hand so I used white melting chocolate instead. When I added the green food coloring it blended strangely so I added some Crisco to create a smoother consistency. 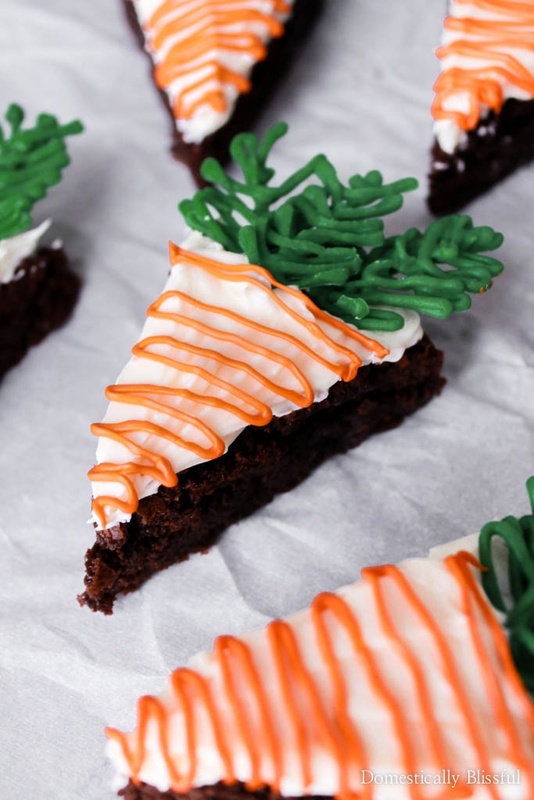 One box of brownie mix makes enough for 16 “carrots,” with 3 stems for each carrot brownie, which means 48 stems. But I recommend you make at least 60-75 in case a few break. That sounds like a lot, but they are really easy & fun to make. I just filled a plastic sandwich bag with the green chocolate, cut off a corner tip, & created the stem design on a piece of wax paper. Then I put them in the freezer & to chill/harden for 10-15 minutes before assembling. Originally I was planning on sticking the stems into the brownie, but I quickly realized that this was not going to work, as the chocolate stems were way too fragile. So I came up with a new solution. I put the first coat of frosting on the brownies and then placed them in the freezer for about 10-15 minutes. Then I placed two stems on top, added a second layer of frosting, & added the 3rd stem to the middle. Freezing before adding the second layer of frosting helps prevent pieces of brownie being visible on top. See the difference between the two brownies in the picture above? 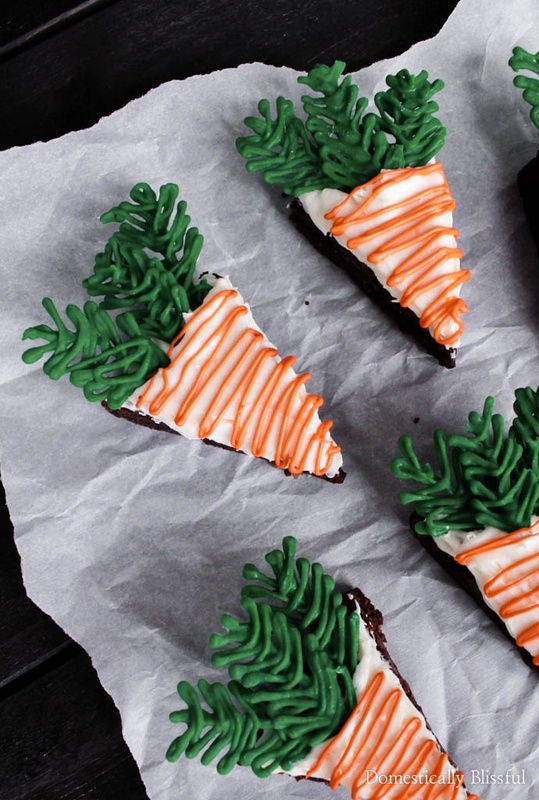 Once I figured this out it was really quick & easy to put together these carrot brownies. I made the brownies on a Thursday night, assembled them Friday, stored them in the fridge overnight, & then set them out 2 hours before we were ready to eat on Saturday. 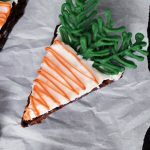 These “Carrot” Brownies were super easy to create & they make a great spring dessert that can be made ahead of time, which makes it perfect for a spring party or Easter brunch dessert! And they are even cuter in person than they are in these pictures! 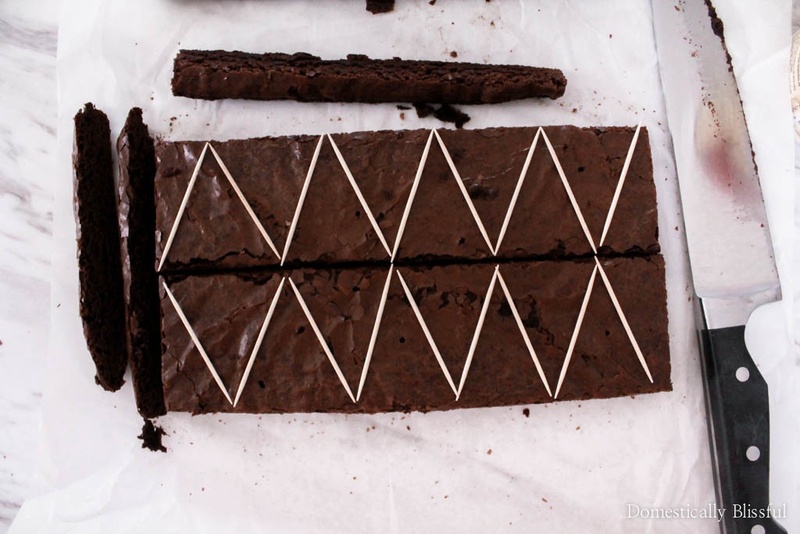 First, cut the baked brownies into 16 triangles and set to the side. Next, melt white chocolate & add green food coloring to desired color intensity, adding Crisco if needed. Fill a sandwich bag with the green chocolate, cut off the tip, & create 60-75 chocolate leaves on a baking sheet lined with wax paper. Freeze for 10-15 minutes. Next, frost the top of each triangle, place them on a baking sheet, & freeze for 10-15 minutes. While everything is chilling, place 1/2 cup of frosting in a small bowl & add orange food coloring to desired color intensity & set to the side. Once chilled, place two of your chocolate leaves on top of the frosting of one of your triangular brownies. Cover with a second layer of frosting & add a third chocolate leaf. Continue this process on all of the triangular brownies. 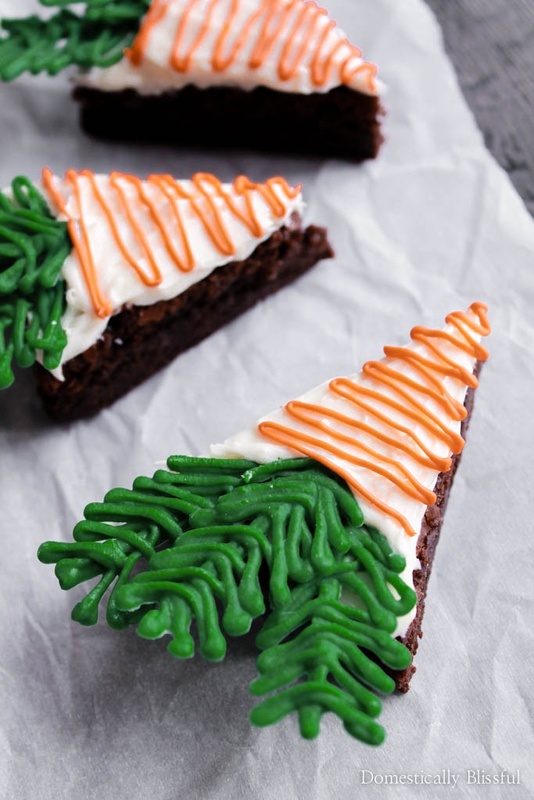 Place the orange frosting in a sandwich bag, cut off the tip, & create zigzag lines on each of the brownies to create “carrot” brownies. *1. I kept my brownies in a baking dish covered with plastic wrap for 24 hours before serving & they were still moist & delicious! 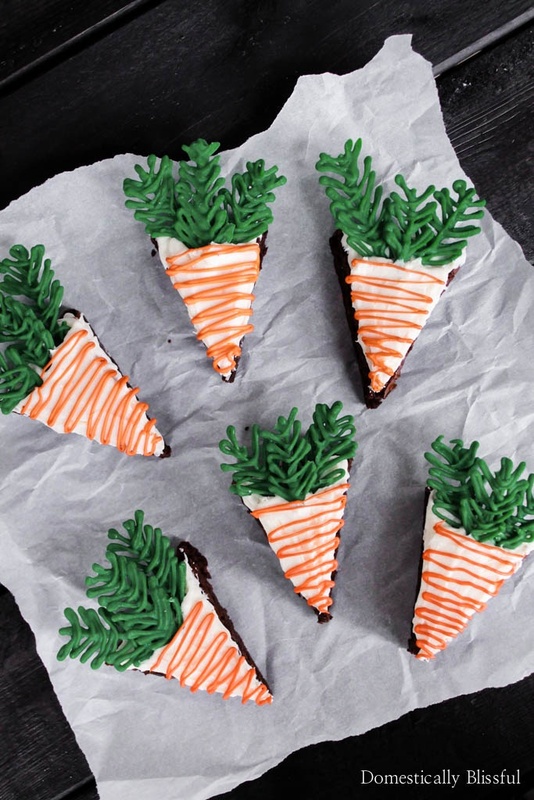 For what event will you enjoy these Carrot Brownies? “Love your neighbor as yourself.” Love does no harm to a neighbor.